Do we really need the hardware and software tags? They don't group all the questions that should belong to them. Their statistics don't make sense, they are both less popular than command-line. They have no additional value when searching, as you would look for more specific things. It's clear from the other tags and title if the question is about hardware or software. It's very weird to add software next to windows-7 or hardware to cpu. There is no single question that actually needs the tag. If a question was tagged software, we have to wonder about what software. Check! If a question was tagged hardware, we have to wonder about what hardware. Check! What software are you thinking about? Or what hardware? Check! So, can the hardware and software tags be obliterated? The problem is that these "meta" tags cover "all" questions on the site, while there isn't a single question that needs such a tag. Can anyone give sufficient counter-examples? From a software engineering perspective, these tags are like god classes while they better fit to be used in the form of the mediator pattern (thus in the form of tag sets). — Originated from: Area 51 - Computer Hardware Proposal Discussion, Chat Discussion & Tagging. Could a (valid) question have the single tag software? Could a (valid) question have the single tag hardware? I think the answer is clearly no in both cases. 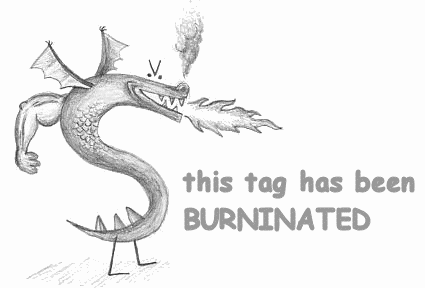 So, I have burninated these two tags. Can [pc], [programs] be obliterated? And [hardware], [software] again? Shouldn't the hardware tag be enabled? Are “error” and “problem” meta-tags? Should we nuke the [calculations], [research] and [malfunction] tags?